Based upon extensive research in primary documents and gracefully written, award-winning author William J. Miller's Decision at Tom's Brook presents significant new material on Thomas Rosser. The Battle of Tom’s Brook, recalled one Confederate soldier, was “the greatest disaster that ever befell our cavalry during the whole war.” The fight took place during the last autumn of the Civil War, when the Union General Phil Sheridan vowed to turn the crop-rich Shenandoah Valley into “a desert.” Farms and homes were burned, livestock slaughtered, and Southern families suffered. prominence as soldiers: George A. Custer and Thomas L. Rosser. They had been friends since their teenage days at West Point, but the war sent them down separate paths—Custer to the Union army and Rosser to the Confederacy. Each was a born warrior who took obvious joy in the exhilaration of battle. Each possessed almost all of the traits of the ideal cavalryman—courage, intelligence, physical strength, inner fire. Only their judgment was questionable. operations and influenced the balance of the campaign in the Valley. Based upon extensive research in primary documents and gracefully written, award-winning author William J. Miller’s Decision at Tom’s Brook presents significant new material on Thomas Rosser and argues that his character was his destiny. Rosser’s decisions that day changed his life and the lives of hundreds of other men. 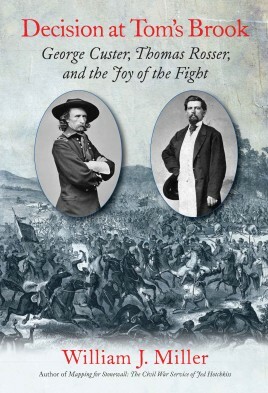 Miller’s new study is Civil War history and high personal drama at its finest. William J. Miller has written or edited seven books and published more than 100 articles on the Civil War including Mapping for Stonewall: The Civil War Service of Jed Hotchkiss, winner of the Fletcher Pratt Award. His next book, Great Maps of the Civil War, was published in 2004. A former editor of Civil War Magazine, Miller is a strong advocate of battlefield preservation. He was a founding director of the Richmond Battlefields Association and has served as a director or adviser of various preservation organizations, including the Kernstown Battlefield Association, Protect Historic America, and the Save the Battlefield Coalition. He lives in Virginia’s Shenandoah Valley. "...well written and well researched monograph on the cavalry battle at Tom's Brook...provides vivid character studiesof the leaders on both sides, particularly Custer and Rosser, and his concluding chapter, documenting Rosser's postwar life and the former generals efforts to defend his war time record, is especially well done...a significant contribution to the scholarship on cavalry operations in the Eastern Theater and on the Confederacy's unsuccessful defense of the Valley during the War's final months."